Blended Learning is a relatively new teaching method, which emerged in the last 8 years. Developed as a combination of classroom teaching and distance learning, this method takes up an important role in the educational system. Big companies were the first to use this teaching and training concept because they expected cost reductions. Nowadays the first research work about the efficiency and the necessary environment of Blended Learning are published. 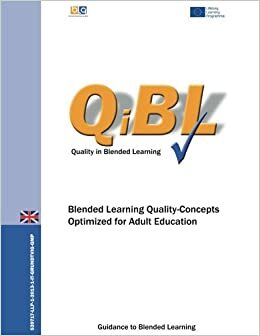 One of the issues mentioned is a missing quality concept for Blended Learning. There exists the ISO/IEC 19796 norm (designed for distance learning) that could be more or less applicable for Blended Learning as well. As quality is beginning to play an increasingly important role in the educational system, the consortium extended the mentioned norms with a special focus on learners’ needs. Additional, the consortium analysed and transferred the results of the research work dealing with Blended Learning into a quality framework for Blended Learning. The project focuses especially on the concepts of the quality of courses, the courses itself, the quality in organizations responsible for Blended Learning courses and activities, and last but not least on the needs and the environmental conditions of the learners. The result is a scientific bases – more or less theoretical – description of a practicable quality framework for Blended Learning, added by a course to teach the developed results. The consortium tested the course in a pilot environment (at the University of Helsinki). An equivalent course was hold with ten participants as a first trial in Wiener Neustadt by the consortium member EBI. Additional there was a compact eLearning course, based on a Moodle environment, developed. The consortium’s members are all involved in education or further education of adults and experienced in organizing courses for adults. The result of the project is a well proofed practicable quality concept (in written form) covering all issues of Blended Learning with a special focus respecting the needs and the learning environment of learners as well. The quality concepts are developed for Adult Education in the frame of a Grundtvig Multilateral Project 539717-LLP-1-2013-1-IT-GRUNDTVIG-GMP. The versatile results of this project are also valid for Higher Education and in the VET sector too. The project results can easily be transferred to equivalent teaching environments in these other sectors of education.